Do artificially illuminated skies affect biodiversity in nocturnal landscapes? The skyglow from cities at night is one of the most dramatic modifications that humans have made to Earth’s biosphere, and it is increasingly extending into nocturnal landscapes (nightscapes) far beyond urban areas. This scattered light is dim and homogenous compared to a lit street, but can be bright compared to natural celestial light sources, such as stars. Because of the large area of Earth affected by artificial skyglow, it is essential to verify whether skyglow is a selective pressure in nocturnal landscapes. We propose two scientific approaches that could examine whether skyglow affects biodiversity. Skyglow occurs when artificial light is scattered by atmospheric molecules or aerosols and returned to Earth, as is shown in Fig. 1. On clear nights, skyglow reduces stellar visibility by outshining faint stars, and in highly developed regions like the Netherlands, there are large areas outside of the cities where the Milky Way is no longer visible (Cinzano et al. 2001). The artificially lit sky is dramatically brighter on cloudy nights than on clear nights, a reversal of the environmental condition experienced during most of evolutionary history, when the celestially lit cloudy sky was extremely dark (Kyba et al. 2011). The luminance of the cloudy night sky is very poorly known, but near urban areas it can be up to thousands of times brighter than is natural. Skyglow is an unavoidable consequence of the use of artificial light outdoors, but the ratio of useful light to skyglow depends on lamp design. Light emitted at an angle slightly above the horizon produces far more skyglow than light emitted towards the street, and blue light produces more skyglow than red (Falchi et al. 2011; Kyba et al. 2012). Legislation in Lombardia, Italy, is credited with keeping skyglow constant from 1998–2010, despite an estimated doubling in the flux of light at street level (Falchi 2011). The level of skyglow in nightscapes can thus be affected through landscape planning. While many acute and often fatal effects of direct light on nocturnal organisms are identified (Rich and Longcore 2006; Hölker et al. 2010a; Gaston et al. 2013), very little is known about what effect, if any, the diffuse light surrounding urban areas has on biodiversity. Because skyglow alters even nightscapes located far from urban areas, small behavioral responses to skyglow could produce significant changes in species distributions. Many behavioral activities are synchronized with lunar cycles. In celestially lit environments, some organisms take advantage of moonless or cloudy nights to avoid predation during orientation, foraging, metamorphosis, and mating, or to synchronize reproduction with relation to the moon phase (Clarke 1983; Gliwicz 1986; Kronfeld-Schor et al. 2013). The addition of artificial skyglow can extinguish such lunar light cycles and permanently remove dark nights from a landscape (Davies et al. 2013; Puschnig et al. 2013). As a result, in one species of zooplankton (Daphnia retrocurva), skyglow was found to reduce the amplitude of diel vertical migration below the limits of experimental sensitivity (Moore et al. 2000). Recently, Dacke et al. (2013) showed that dung beetles (Scarabaeus satyrus) use the diffuse band of light produced by the Milky Way on clear moonless nights as an orientation marker. Although Dacke et al. (2013) did not discuss it, their results imply these beetles lose much of their ability to orient, and suffer reduced fitness in areas affected by skyglow. Since there is no reason to believe that Milky Way navigation is restricted to Scarabaeus satyrus, we wonder whether skyglow is selecting against this remarkable trait worldwide, with possible consequences for biodiversity and ecosystem services? It was recently reported that dung beetle diversity is reduced with increasing urbanization (Korasaki et al. 2013). This loss is of special relevance for perturbed agro-ecosystems, since species-rich dung beetle communities are able to buffer ecosystem services such as dung decomposition and nutrient cycling (Beynon et al. 2012). Perhaps related studies focusing on nocturnal communities could test whether skyglow is indeed a selective pressure. Reviews of studies on the effects of light at night have argued convincingly that skyglow must surely affect food webs and biodiversity, but no studies to date have demonstrated this. Navara and Nelson (2007) provide an excellent review of the effects of light on behavior and physiology, but changes due to skyglow are inferred based primarily on observed response to natural light levels (twilight or moonlight) or simulated studies in enclosures. Two such examples presented by Longcore and Rich (2004) are the dependence of coyote calling on moon phase, and the luminance range under which treefrogs are willing to forage. Longcore and Rich (2004) also discussed an unpublished result in which frogs halted mating during periods when a nearby stadium was lit. While these studies demonstrate or strongly imply that behavior is likely to change under conditions of skyglow, they don’t prove that skyglow has affected biodiversity in nocturnal landscapes. One possible test of whether skyglow is a selective pressure would be an experiment similar to Korasaki et al. (2013), but in landscapes with little fragmentation, and specifically testing the relative changes in number of individuals for a selected pair of diurnal and nocturnal species that are in direct competition for an identical scarce resource (e.g. dung or carcasses). If skyglow reduces the fitness of the nocturnal organism, then its numbers should decline more quickly along an increasing skyglow gradient. Proximity to urban areas will result in confounding factors, but with a careful study design based on skyglow maps like those published in Cinzano et al. (2001), it should be possible to separate skyglow from other urban effects. Noise may be a particularly important factor, because urban noise decreases at night (Nordt and Klenke 2013). In fact, for noise-sensitive organisms, nocturnal species could potentially outcompete diurnal counterparts as proximity to the urban area increases. 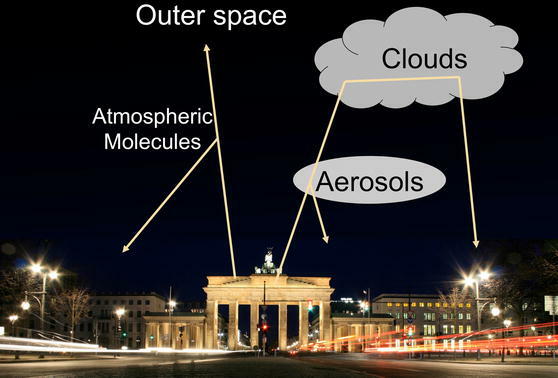 Global maps of night sky luminance under cloudy conditions would enable a similar experiment. Species and genotypes that are most active on cloudy moonless nights are likely to be particularly sensitive to skyglow. If a “tipping point” occurs within a landscape, in which clouds brighten the sky in one area and darken it in another, then sensitive species and genotypes should be much more abundant in the areas where clouds darken the sky. These proposed experiments demonstrate that an interdisciplinary approach is essential to understand the effects of skyglow, and to devise strategies for its mitigation (Hölker et al. 2010b). While the last several years have seen an increase in the number of interdisciplinary groups studying light pollution (for example the newly formed “Loss of the Night Network” funded by the EU COST program), the biological effects of skyglow (as opposed to direct light) on a landscape scale continue to be neglected. How have organisms, communities, and ecosystems responded to skyglow? Unfortunately, despite the immense area affected, nobody knows. Are plants and animals able to adapt, or are certain habitats simply lost? 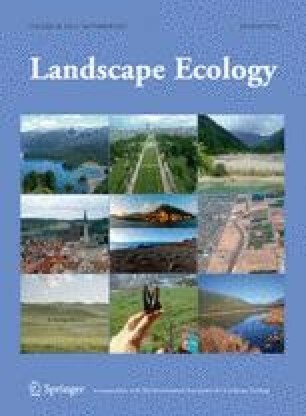 Are ecosystem services affected? If skyglow impacts entire nightscapes, then to what extent is skyglow connected to biodiversity loss worldwide? These questions deserve serious consideration, because light emission is believed to be currently increasing globally at a rate of 3–6 % per year (Hölker et al. 2010b). In contrast to other anthropogenic modifications of the biosphere, it appears to be the case that artificial skyglow could be dramatically reduced through simple lighting design changes undertaken over a 1–2 decade period, with cost and energy savings as a byproduct (Falchi et al. 2011). While we are convinced that urban skyglow must surely be threatening biodiversity worldwide, there is as of yet no direct evidence for this in the scientific literature. Proof that skyglow selects for or against certain genotypes, species or influencing ecosystem processes would have major ramifications for conservation biology, as well as for lighting policy and landscape planning. CCM Kyba’s position is funded through the Verlust der Nacht project of the Federal Ministry of Education and Research, Germany (BMBF-033L038A).